Le Pavot, French Holiday Villa, Beach, Heated Pool, La Tranche, Vendee, France. "We had an absolutely fabulous holiday between biking, surfing, beaching, barbequing, and trying to buy the best shell fish and prawns for the barbeque"
"The property truly exceeded our expectations. It was spacious, superbly equipped and in a wonderful location. We have been holidaying in France, now, for several years. In terms of Value For Money, Le Pavot easily exceeds anywhere else we've stayed. We will be booking again - very soon!" "We had a great time thank you. The pictures on the website do not do the villa justice. It far exceeded expectations"
"The weather was glorious however the best feature of all was the location, style and standard of your villa with added feature of a stunning swimming pool"
"The situation was perfect both quiet but via the cycle paths giving easy access to the town and beach"
"The beach itself was fantastic especially using body board. Though the weather was nice the fact that the pool was heated made all the difference"
Le Pavot is a new build traditional French style five bedroom, two bathroom beach villa ideal for up to 11 people + Infant(s). Situated on the edge of La Tranche sur Mer, (Vendee, West Coast of France) in the small and exclusive estate of Quichenottes. With a large private heated (all year round system) pool, garden, wireless broadband, and all mod cons. Le Pavot is the ideal place for a self catering French gite rental holiday. France at it's best, with a superb beach and heated pool. We can also offer for our customers discounted ferry crossings. 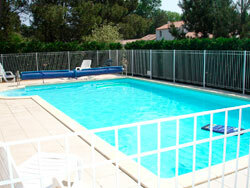 Heated Pool, 5m x 10m with fencing & locking gate for additional safety. Villa is south facing, double doors from lounge lead to heated pool & garden. Few other rental gites or villas in the Vendee with similar high spec. Some of Europes finest Beaches just 10-15 min walk through woods or ride along short cycle track. 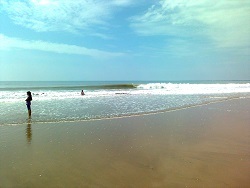 13km of sandy beach ideal for swimming & water sports of all kinds. Monitored bathing & surfing school on local beach. The Charente and Vendée regions are blessed with microclimate ensuring high probability of hot sunny days during the summer. With nearly 100 miles of sandy beaches backed by pine forests and easy access from the southern channel ports, it is a popular destination for British and French holidaymakers seeking a sun, sea and sand holiday. However there is much more to this area than beaches including fortified cities, islands, wetlands and vineyards. It is worth travelling inland from the coast to see rural France at its best as well as some highly rated theme parks such as Puy du Fou and Futuroscope. Fabulous sandy beaches, unspoilt countryside, historical cities and fine food and wine are just some of the attractions that this part of France can offer. The Vendee is situated in the west coast of France and features mile upon mile of golden sandy beaches that slope into the clear blue sea. It is the perfect place for water-sports or relaxing in the sun. With its wonderful west coast climate, it is the perfect place for family beach holidays. Explore the beautiful French countryside, visit Roman remains, world famous Cognac or take a trip to grand old cities or famous chateaux, there is plenty for everyone in the Vendee. The Vendee area is also famous for its wine. It boasts acres and acres of vineyards that produce wines such as Muscadet and Gros Plant. 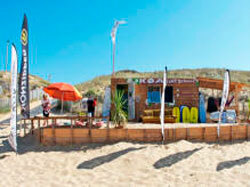 La Tranche has some of the best sandy beaches in France and offers a range of water-sports for the more adventurous. There are also many picturesque towns and fishing ports to explore in the area. La Rochelle is only a short distance away, this is France's 2nd largest boat building port and the historic Vieux Port remains largely unchanged. A daily fish market can be found in the old town until 12:00 midday. The port is very attractive and waterside cafés and restaurants offer a relaxing break. The seafood platters are their speciality and are excellent especially for large groups, where a single huge dish of shellfish is produced. The new marina holds Europe's largest aquarium which is open 365 days a year and has a large selection of fish from highly coloured tropical types to eels and sharks. We can organise discounted surfing lessons through one of the local schools that offer these on our La Terriere beach, series of 5 x 1.5 hour lessons, or single lessons.